Working in a slaughterhouse is considered one of the most dangerous jobs in America. The abuses of workers on some fishing vessels are even worse. The rate of slaughterhouse worker injury is now triple that of other manufacturing and processing jobs. Their injuries run the gamut of everything from repetitive motion injuries, to serious cuts and amputations, to a high incidence of certain cancers and autoimmune diseases that are strongly associated with handling meat. Human Rights Watch concludes that slaughterhouse workers have the most dangerous job in America. One of the leading determinants of the injury rate at slaughterhouses is the speed of the disassembly line. The faster it runs the more likely a worker is to get hurt. The processing speed has been greatly increased in recent years in the drive to maximize profits and produce cheap meat. The extraordinary psychological stress workers experience is caused not only by the grueling work, but also from the emotional effects of being involved with killing and dismembering so many animals, often covered in their organs and tissue, and standing in their blood while doing it. There are numerous reports of high levels of drug use at meatpacking plants, and new research indicates that these stressed-out workers become prone to criminal behavior in general. 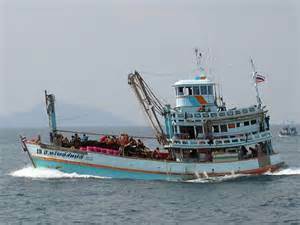 The seafood industry in Thailand suffers from widespread worker abuse amounting to slavery. Virtually all American and European companies that buy seafood from Thailand are at risk of receiving products tainted by slavery. A recent report catalogs deceptive recruitment practices, hazardous working conditions and very severe violence on fishing boats and in processing factories. While authorities try to improve these problems, the best answer is to go veg. You’ll not only stop supporting worker abuse, but you’ll help the animals and the environment as well. See all our postings on how workers are impacted by animal agriculture and fishing.